As part of the Sister Cities program, a group of five Minneapolis artists went to Tours, France the first week of June to sketch the city landscape: Kathleen Fenske, Julie Baugnet, Cris Franchevich, C.B. Sherlock and Richard Stephens. The group had the opportunity to draw with the French chapter of the Urban Sketchers – an all-volunteer nonprofit group dedicated on-location drawing and received enormous support from the local community, drawing together in the large network of pedestrian-friendly streets, bike lanes and plenty of public spaces with plazas and squares, presenting itself the perfect field to practice observational drawing and community-engaged art. We embraced the Urban Sketchers idea to reclaim the city as a place for gathering, to meet the occupants and encourage connections in the community, to see the city with the eyes of a “flaneur”, a word in French meaning a wanderer, vagrant or explorer using observational drawing as a language to capture impressions. We are very grateful to the community for the warmth and hospitality and the opportunity to tighten ties between the two cities. 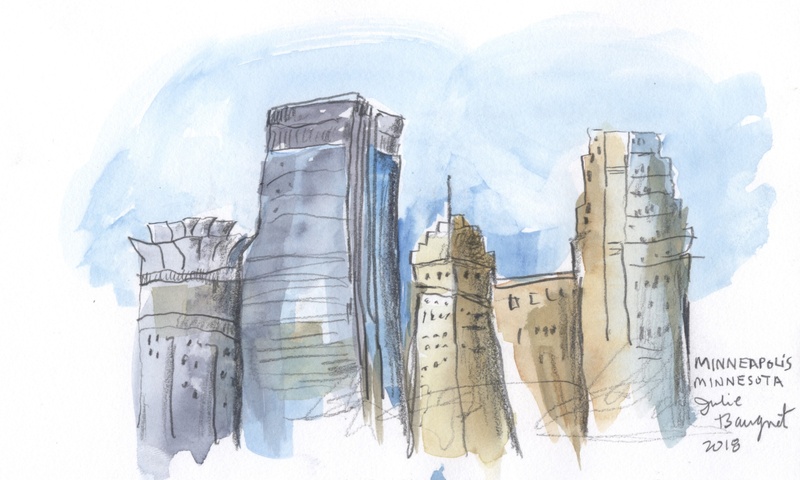 Learn more about urban sketchers and see more images by visiting the website of Tours-Minneapolis or read an article about the group’s visit in La Nouvelle Republique. I just read the below article and I see it on the Sister City page in France. Nice work!